Is There Nutmeg In The House? 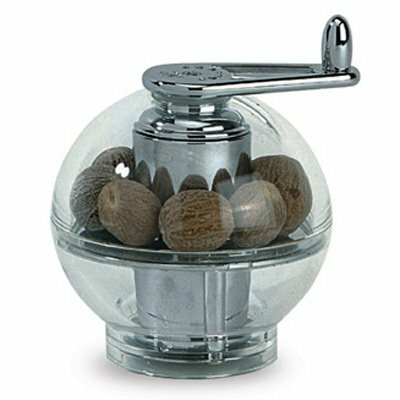 Do you have Nutmeg in your house? 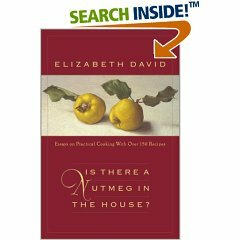 The title of this book actually refers to another situation in which Elizabeth David becomes disappointed with restaurants not keeping a nutmeg grinder for their clients to use when they are served various dishes with cheese or pasta. Nutmeg is actually native to the East Indies and was very popular from the fifteenth to the nineteenth century. It is one of the original spices cultivated in Tidore and Ternate, two tiny Spice Islands in Eastern Indonesia. The best nutmeg is now grown on the Island of Grenadain in the West Indies. A yellow peach-like fruit is harvested with a woven wicker basket attached to the end of a long pole. The inner seed is the nutmeg spice and is superior when freshly ground. The red-orange net/aril covering the outer seed is dried and ground to produce mace. Elizabeth David’s writing in “Is there a Nutmeg in the House” is much more scholarly than I had expected. These are essays describing the practical, historical and earthy aspects of cooking. She does however often make your mouth water with tales of remembering “cake with orange icing” or gathering fresh mushrooms from fields near her home as a child. This book begins with a brief overview of Elizabeth’s life. Most of the memories involve cooking. She even cooked in a kitchen in Egypt. This might explain recipes for “Spiced Lentil Soup.” She defiantly likes spicy foods and also has a recipe for Garam Masala. She shows her love and dislike of various dishes, ingredients and recipes. She also describes her dream kitchen and would definitely not approve of my refrigerator being next to the stove. I have to admit the pictures of her kitchen are quaint and the use of a table in the middle of the kitchen made me nostalgic for my grandmother’s kitchen. I learned to make my grandmother’s apple pie on a small table in her kitchen. Many cooks find a table essential to roll out pastry. I also loved the use of a French armoire, English dressers and wooden plate racks in her kitchen. While the kitchen looked more cluttered in comparison to today’s streamlined sterile spaces, it has a sense of beauty and comfort. I at times long for a kitchen with a fireplace, just to warm up the atmosphere. While the modern kitchen is more practical, they can at times feel cold. Unless of course you pack them full of cookbooks. She had quite a collection of cookbooks and it shows in her writing. She does seem to have a working knowledge of the history of cuisine. Through her own research, she helped to change the way we think about food. The material in this collection has not appeared in previous books. Here she emphasizes authentic recipes and fresh ingredients. The recipes are written out in paragraph style. They are more of a conversation with the cook than a quick formula. In this way you can obtain valuable insight into the methods or reasons for why food is prepared in a specific way. I did not however find out how to extract juice from a pomegranate. I was asked this question and since I never had to deal with the question before am still trying to figure out if everyone else out there uses a sieve and presses out the juice. Seems to work. Elizabeth spends a great deal of time discussing “oxo cubes” and discusses the fear cooks feel when a recipe calls for “stock.” I remember such a fear before I discovered stock pastes. Of course these days stock can easily be made in a crock pot while you are at work or you can really just use a stock base/paste. I have to agree with her when she says that it is satisfying to learn how to “cook from scratch.” She mentions this in regards to making stocks. A homemade soup made with homemade stock can be incomparable. While making stock still remains a valuable skill, I can’t imagine wanting to learn how to make yogurt. Like a Frenchwoman not wanting to make her own bread, I prefer to leave yogurt up to the experts. Still, if you wish to know, Elizabeth has included this information. These days many also make their own cheese and bread, so I guess why not yogurt? I make bread myself. Mostly because the homemade taste is superior. I had to laugh as I read about her dissatisfaction with a garlic press. Could this be similar to the one we use today? I love my garlic press. Please don’t make me live without it. It sure saves peeling cloves. I can extract the garlic paste in no time for recipe after recipe. You might be amused by her recollection of her housekeeper in Greece tossing a basket of live seafood on her “eiderdown.” What a character. Enjoyable reading and essential for anyone who is interested in culinary history. nutmeg tree. The fruit resembles a small peach or apricot. is a thick, fibrous husk underneath the skin of the nutmeg fruit. which contains the nutmeg seed.